Our Junior Church offers a friendly and welcoming environment to children of all ages. Currently (April 2017) approximately 15 children attend regularly with a further 15 children coming on a more occasional basis. Get ready. Tell a story using objects and artefacts. Explore the story more with open questions and discussion. On he first Sunday of the month the Crèche room is available for parents / careers to use for babies and toddlers during the service if required. There are various activities and Bible-based learning sessions (age specific) for Children and Young people. Please do not hesitate to ask for directions to the right group. 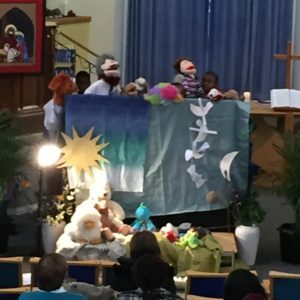 Teaching is based on the Scripture Union materials, introducing the children to Bible stories and involving them in singing, activities and games. The older children are encouraged to join in discussions. Each group has a leader and helpers who are encouraged to attend courses during the year and have been DBS checked. 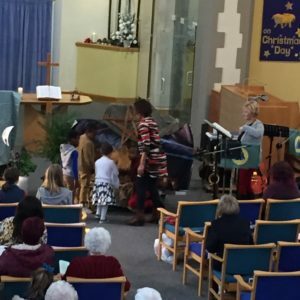 The Junior Church helped to lead the ‘all age’ Christmas Nativity. This year (2016) our puppet club also joined in the fun. On occasions children and young people may have the opportunity to experience Communion. At AAURC it is the decision of the parents/ carers as to whether they feel it is right for their children to partake in communion. Please indicate to the elder as they bring around the bread and fruit juice if you do not wish your child to take part. If you are a parent/carer and have any concerns or questions about your child taking communion please speak to the Minister.